An expert combatant with exceptional skills in espionage, Natasha Romanov is the elite agent, Black Widow. 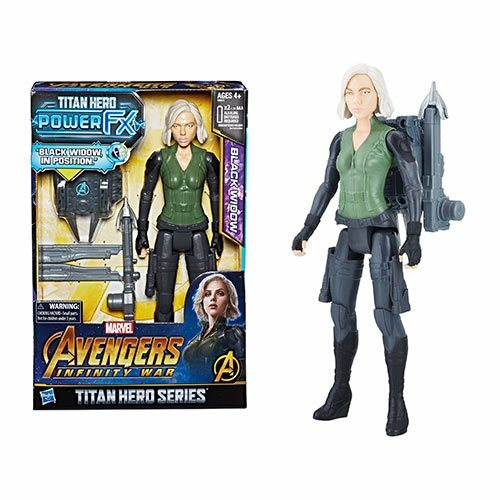 Imagine elite agent joining the mission for justice with the 12-inch-scale Titan Hero Power FX Black Widow, inspired by the Avengers: Infinity War movie. This figure includes a Titan Hero Power FX pack so when kids connect the pack, they can power up their figure and activate character-specific sounds and phrases from Avengers: Infinity War! Connect Titan Hero Power FX pack to compatible Titan Hero Series figures to activate character-specific sounds and phrases in favorite super hero and villain figures! Titan Hero Power FX pack sold with Titan Hero Power FX figures. Additional figures each sold separately. Subject to availability.